"You don't put stuff on your head if you're president," he famously said last year when he was offered a helmet while visiting the Army and Air Force football teams. Candidates and politicians are routinely handed hats to put on: Hard hats, ball caps, helmets, you name it. In general, these photo ops have created more mischief than magic, as former presidential candidate Michael Dukakis found out the hard way. Media relations types have made much of advising their principals not to accept offers for headgear. When you drop your guard, opt for transparency and make an honest connection with someone, you're right on the edge of foolishness, which is another word for not-corporate, not-aloof, not-safe. Another word for human. So, are you aiming for safe or human when you set up photo ops? Think about it. 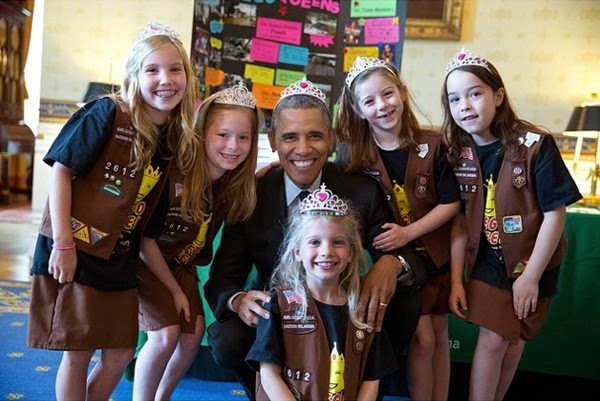 As The Broad Side pointed out, if one of these Girl Scouts winds up getting elected as president, this picture will have a major second life. But even if they don't, it was an irreplaceable moment, made even more so by that extra tiara.